The English typewriter has a unique design and is incredibly rare. It is a downstrike typewriter that uses gravity to bring the type back up after printing. Designed by Morgan Donne and George Cooper, the English was supposed to be a British answer to American imports. Hence the name English. Imports from America were comparatively cheap on the British market. â€œBuy Britishâ€� was the slogan that had to save the economy. One way to fight the competition was to cut the number of parts in typewriters. That is what Donne and Cooper did with the English. Keytop and keylever were one part. When the keytop was pushed down, the other end came up and hit the counterweight of the typebar, sending it swinging down onto the paper. The counterweight would than bring the typebar back up. An extremely simple design, but not overly effective. 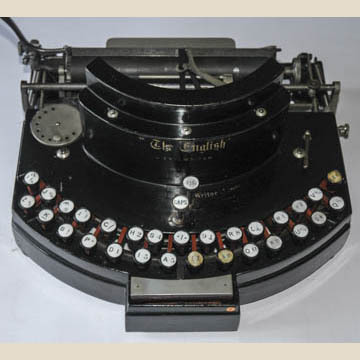 The English was built for a very short period of time before the factory went broke and was bought by â€œColonelâ€� John North, bird-poop king of the colonies, who put Cooper and Donne to work to design his excellent, heavy and almost equally short-lived Northâ€™s typewriter. See page 114 of the book Typewriter for the story of North and his typewriter.